With This MTN Missed Call Alert. You Have The Ability To See Who Called You, MTN keeps you up to speed with calls you missed while your phone was switched off or unreachable while also sending you an SMS message when a number you could not reach becomes available. The SMS message with information about calls you missed or numbers you could not reach will be sent to your mobile phone as soon as your mobile number becomes available or as soon as the number you attempted to call becomes available. What Is MTN Missed Call Alert? This is a FREE missed call alert service that provides you with details of calls you missed while your number was switched off or out of network coverage. You will receive free SMS message containing the caller’s phone number, the number of missed calls from that number andand date and time of the last call. Y’ello! You have 1 missed call from +2348031234567 received at: 03:05:2011 12:21:13. How Can I Activate MTN Missed Call Alert? 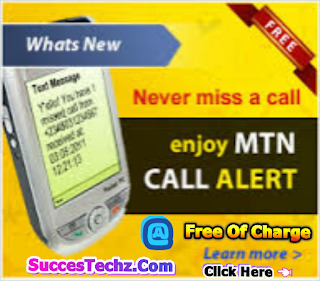 ✔ To activate MTN Who Called, text SET 01 to 100.Once this is done, you will receive the message: Y’ello! 803xxxxxxx request to activate Who Called Service was successful. Thank you. How Can I Cancel MTN Missed Call Alert? ✔ To cancel the service, text the word DELETE to 100. You will receive the following message:Y’ello! 803xxxxxxx request to deactivate Who Called service was successful. Thank you.